Ryan Gosling's debut as a writer and director wasn't well-reviewed, but it has some things going for it that keep me interested: the spooky underwater town and a cast that includes Christina Hendricks, Saoirse Ronan, and Matt Smith. Gonna be low on my To Watch List though. Critics were divided on Me and Earl and the Dying Girl, mostly around the tone. Some found it charming while others described it as snotty and in love with its own specialness. Only one way to find out where I fall. 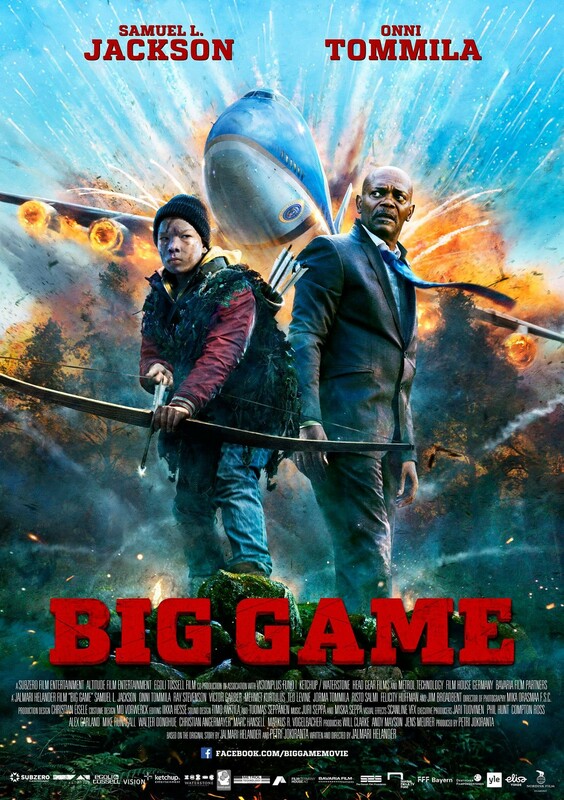 Always in the mood for a movie where Samuel L Jackson plays the President of the United States and has to fight off bad guys in the wilderness alongside a kid with a bow and arrow. I like Jason Segel a lot and Jesse Eisenberg some, but I'm especially looking forward to the movie's exploration of the shifting definitions of success. It's tragically fascinating how people are rarely satisfied with whatever level of success they've achieved. We're always reaching for that next rung. 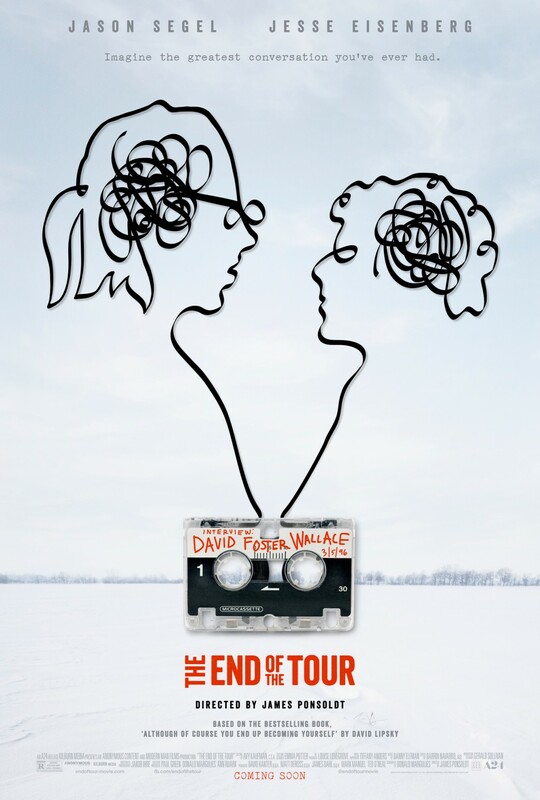 Would love to hear what The End of the Tour has to say about that. I'm ready to see Kevin Bacon play a good guy again, but until that day, I'll take him as a crooked sheriff chasing a couple of kids who've stolen his ride. I quit watching Scream Queens about three minutes into the pilot, but the idea intrigues me. And since there was also a 2015 movie with the plural version of this exact title, I'm thinking a double-feature might be in order. I like all these people and the trailer intrigued me. Looks like a twist on the traditional romantic triangle with higher stakes due to the post-apocalyptic survival angle. I'll pretty much see anything with Anne Hathaway in it these days. Likewise Hailee Steinfeld, but especially a Western with a bunch of tough women. I know it's supposed to be the worst movie of the year, but I like Hugh Jackman and the Peter Pan story enough that I can't ignore it. Besides, it can't be worse than Hook. Cop Car is directed by Jon Watts, who was recently named director of the latest Spider-Man reboot. Since he hasn't done much else, this must really be something. At least I hope. 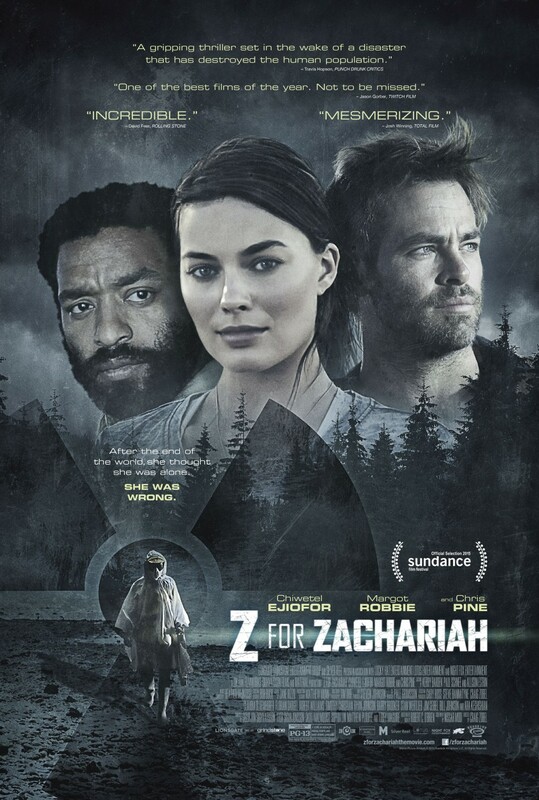 I read "Z is for Zachariah" a long time ago, but I hardly remember any hubbub about it in theaters. I could give or take Ryan Gosling. He's great in something like Crazy Stupid Love, Ides of March or Gangster Squad but then you get something like The Place Beyond the Pines and Drive (which I thought was rather underwhelming). But, I tell you what, I think he looks GREAT in The Nice Guys with Russell Crowe. Dying Girl looks millennial quirky to me. I could be wrong. Big Game - It's White House Down in the forest. And I'm not 100% on board with Mr Jackson anymore. I still like him, but I don't want to automatically see him in everything. Because he's in EVERYTHING. Cop Car looks like it could be pretty good. Same with Final Girl, but that one could also go sideways. Intern looks pretty GREAT. However that may be one of the worst posters I've seen in the last 15 years. We agree, I am also on board with Keeping Room. Pan. Yeah, I'm kinda baffled by the negative press on this movie. I think it looks zany and kind of awesome. Did you ever see Stardust? That's what it reminds me of. And it's produced by one of the Flash/Arrow/Supergirl guys, Greg Berlanti. I'm going to watch it. PS - I didn't hate Hook like everyone else seems to. Not that this has any bearing on me liking Pan. 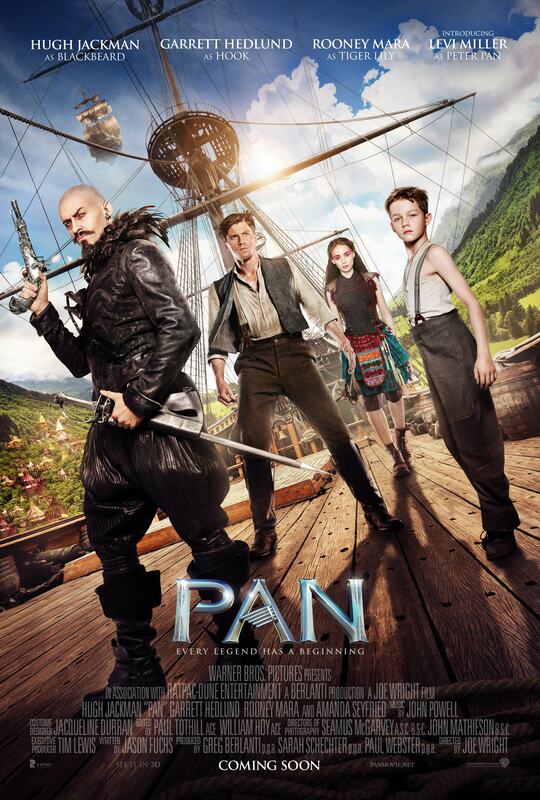 Also, it probably doesn't help that the tagline for Pan is ripped straight from The Phantom Menace. Erik, you're right about Z for Zechariah. It kind of sneaked out at the end of the summer. I think I saw one trailer for it. Didn't even know it was based on a book. Cool info on Jon Watts, too. That'll make me watch Cop Car with even more interest. Pax, I saw a trailer for Nice Guys last night and I agree. Looks fantastic. I did see Stardust and I like it a lot. I'm hoping that Pan is a movie like John Carter where everyone smelled the blood and dogpiled it, but that I'll end up enjoying it. That tagline though: Ha! Big Game escaped my notice but I am so into that one right now. I needs me a goofy premise like that. I've seen "Pan" since this post. Its not terrible, it just has a paint by numbers script and a director who is clearly more interested in special effects. If nothing else, watch for Hugh Jackman who is having the time of his life as Blackbeard. Garrett Hedlund's Hook feels like a cross between Indiana Jones and Karl Urban as Dr. McCoy. Its not a bad performance its fascinating in how odd it was and I'm curious if its the writer, director or actor who is responsible for that choice. I don't like the design of Blackbeard, but I love Jackman, so that was one of the draws for me. The other was the portrayal of Hook, so your comparison to Indy and Urban is encouraging. I won't raise my expectations for the movie, but you've reinforced my desire to see it. Thanks! 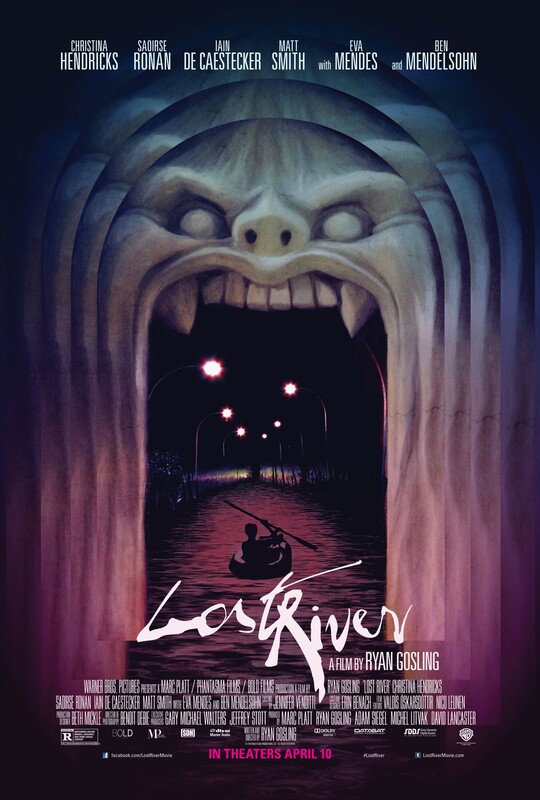 Lost River: What is this?! Sounds really interesting. 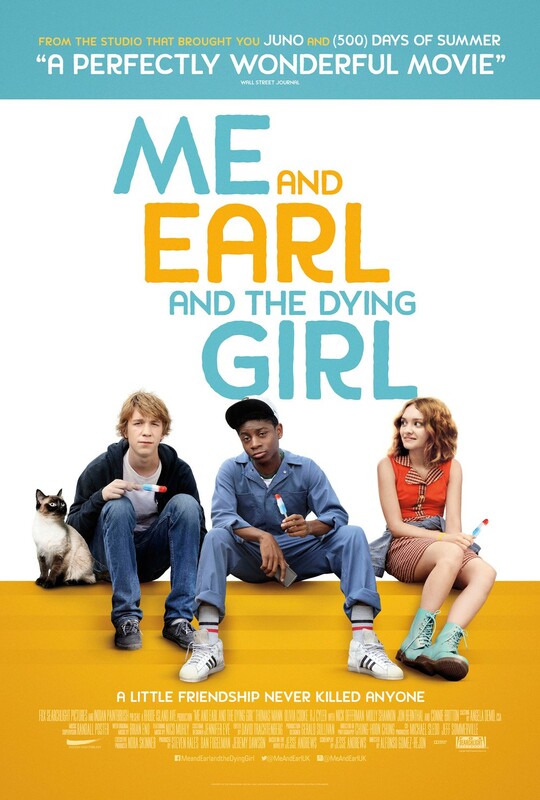 Me and Earl and the Dying Girl: Plan on seeing it too. Big Game: Sounds crazy. Keeping it in mind. The End of the Tour: I'm taking notes. 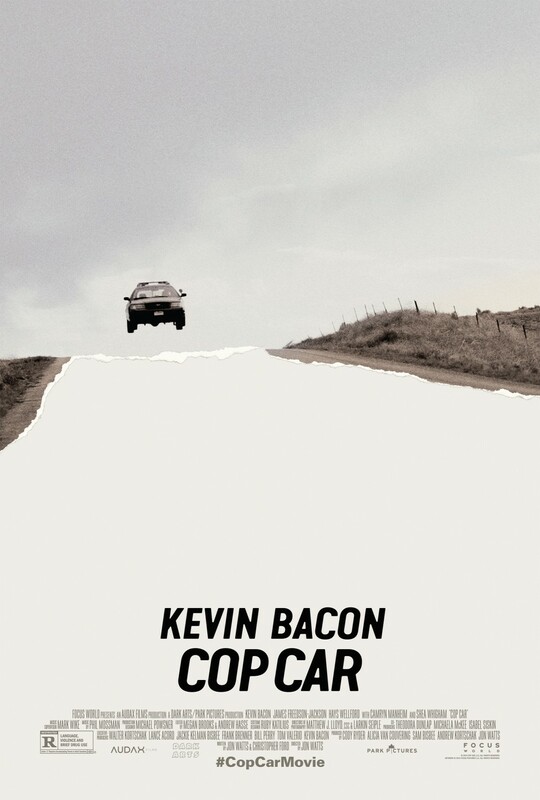 Cop Car: Kevin Bacon is... Cop Car. I think I heard something about this, can't remember what. Final Girl: Looks like weird TV fare, but keep 'em coming. Z for Zachariah: Mmm... Margot Robbie. The dudes aren't bad either! 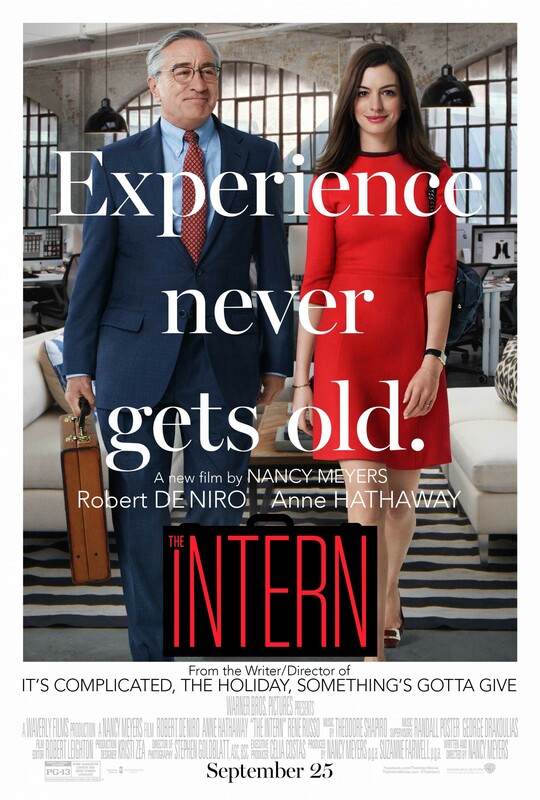 The Intern: One of the Baby Boomer movies, but dead to rights on Hathaway. 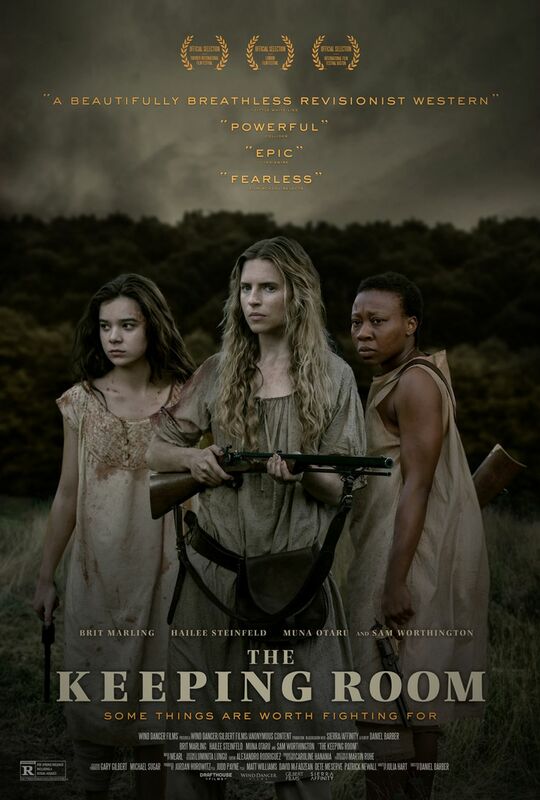 The Keeping Room: Oh Brit Marling made another movie? Always interested in the stuff she chooses (though in this case did not write, ah well). Pan: Heard it was terrible, don't really want to put it to the test. Probably no worse than Hook, that's true. So haven't seen a single one of these either! People seem very divided about that movie. It's been a while since I've seen it, so maybe I should have a second look, but my memory is that Williams was overly earnest, Hoffman was too hidden beneath prosthetics, and Julia Roberts had no business playing Tinkerbell.